The Voyager 1202g is the direct successor to the Voyager BT 9535. Its extremely improved performance is based on the 1200g, also adding a Bluetooth device to the series. 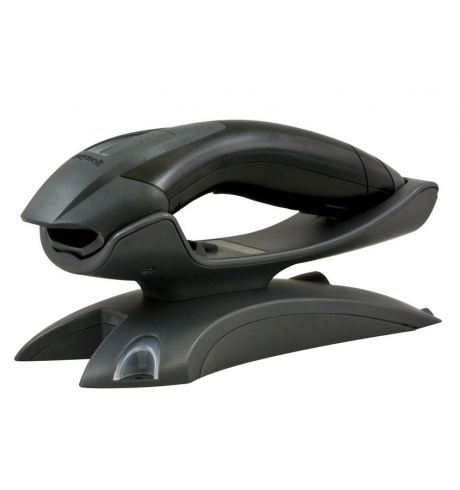 The handy scanner ideally suits checkout areas and smaller warehousing and manufacturing facilities. The Voyager 1202g is very user-friendly: The base station is easy to connect to a host through its plug & play multi-interface. To save space you simply mount it vertically. Thanks to Bluetooth class 2, users scan 1D and GS1 barcodes within a 10 m radius (up to 30 m with a clear line of sight) without cable tangle. It is easy to find the scanner after it was misplaced in a rush; with the press of a button on the cradle, the scanner will start to blink and beep. The 1800 mAh battery provides 12 hours of operation (or 45,000 scans) and recharges rapidly. It can also be replaced in the blink of an eye and without any tools. Weighing only 180 grams, it does not tire out the user.